If your running a business that strives to be always active, you can greatly benefit from using DaaS. With this, you can have access not only to your files, but also to your computer’s whole desktop— from operating system and software applications, to folders and other desktop features. It revolutionizes the way you get the job done, and here at HoustonTech, we can help your business experience just that. At HoustonTech, we can help you incorporate DaaS or cloud desktop into your business. 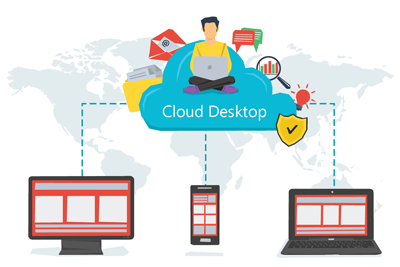 Our cloud desktop service is guaranteed to be safe, simple, affordable, and effective. With HoustonTech’s team of experts, your business can have a fully-functioning cloud desktop system in no time, and we will even take care of the continuous monitoring and maintenance, so you can focus on the more important aspects of your business. Whether your employees are using a laptop, tablet, or simply their phones, you can be sure that they can easily access the files they need 24/7, wherever they may be. For your cloud desktop needs, trust only HoustonTech! Give us a call at 832-630-4986 from Monday to Friday, 07:30AM-07:00PM, and let’s discuss the best cloud desktop solutions for your business.